SAE L.A.'s career services team was fantastic: they helped me to find great work within a month after I graduated. "I love working with clients for television and the variety of music it entails,” says Rad, who has a Master's Degree from Berklee College of Music. “Recording orchestral cues are my favorite because they remind me where I've come from. There's something about getting sounds for a 24-piece orchestra: dancing meter-levels look even better to the sounds of glissandi." Rad grew up in Washington, D.C. His musical influences growing up included listening to classic rock during the day and classical music at night with his father, Persian music with his mother, and mix tapes of techno and trance that a cousin from Los Angeles sent to him. At 19, Rad began composing his own original music. Rad discovered SAE after hearing about it from a friend who was enrolling. 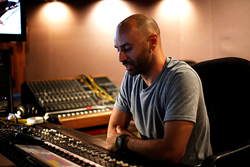 He felt that attending the school offered “a great way to interact with like-minded people in the audio engineering field,” and that it was what he needed in order to establish a career as a music production professional in Los Angeles. Along with SAE’s curriculum and facilities, Rad was also impressed that SAE’s international campuses offered opportunities for working overseas. Among Rad’s first production credits after graduation from SAE in 2011 was working as the assistant engineer with legendary blues guitarist Walter Trout on his album “Blues for the Modern Daze,” which reached Number 1 on the Billboard Blues chart. Shortly thereafter, Rad assisted on an album by another blues legend, guitarist John Mayall, aka "The Godfather of Blues." Working his way up to principal engineer, he currently works at Entourage Studios and Cut Recordings, and also develops a personal client list at his home studio. Along with his many television projects, Rad also engineered the strings for “As You Are,” a track written by Van Dyke Parks on the recently released album “The Golden Echo” by Grammy-winning vocalist Kimbra. He’s also doing voice over work on a major video game franchise and engineering for students at UCLA’s film scoring program. Navitas is an Australian global education leader, providing pre-university and university programs, English language courses, migrant education and settlement services, creative media education, student recruitment, professional development, and corporate training services to more than 80,000 students across a network of over 100 colleges and campuses in 27 countries. Learn more at Navitas.com.